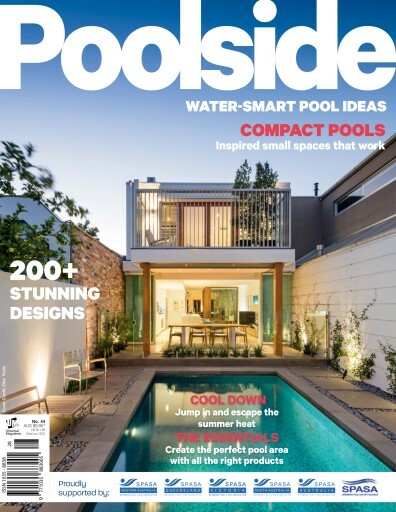 (0 Customer Reviews) | Write Review 2 issues per year Poolside is Australia’s premier pool publication. Full-colour, large format magazines, they reach prospective pool buyers and existing pool owners right across the country. Each issue of Poolside contains informative features on design issues, maintenance questions, new materials and stylish poolside accessories. Also, more than 100 individual designs are featured in each issue. Poolside’s photographers are the best in the business, providing stunning images that captivate readers. Each issue of Poolside contains informative features on design issues, maintenance questions, new materials and stylish poolside accessories. Also, more than 100 individual designs are featured in each issue. Jump right in to Poolside 44 and cool off for summer. Featuring Australia’s best pools and outdoor areas, you’ll be filled with inspiration for your own outdoor oasis. Discover the top backyard trends for 2015, trial tasty poolside BBQ recipes & learn how to reduce your pools eco-footprint. 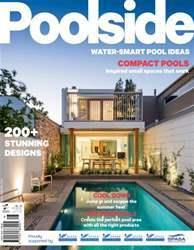 Poolside is Australia’s premier pool publication. Full-colour, large format magazines, they reach prospective pool buyers and existing pool owners right across the country. You'll receive 2 issues during a 1 year Poolside magazine subscription. You'll receive 2 issues during a 1 year Poolside magazine print subscription.